One grey late-winter day, you come back from a long day of work, just wanna sit in front of the TV, watch some football, have a cold beer and something to munch on. Fried food always go good on these settings. This carelessness, shutting down your brains to clog your arteries, and flushing it off with some light bubbly booze. Unlike Britons, I don’t like led in my fish so I won’t serve it in a newspaper, in the traditional way, and unlike everyone, I’d also won’t care for fish in my fish, so… I was looking for some soft and relatively taste-neutral form of tofu to play with. Potatoes. I like my fries wide. Soaked in ice water and dried. Fried once in medium-high heat, colled, and then again in very high heat. – blend all (besides the gherkins) well, until solid. Add them last. 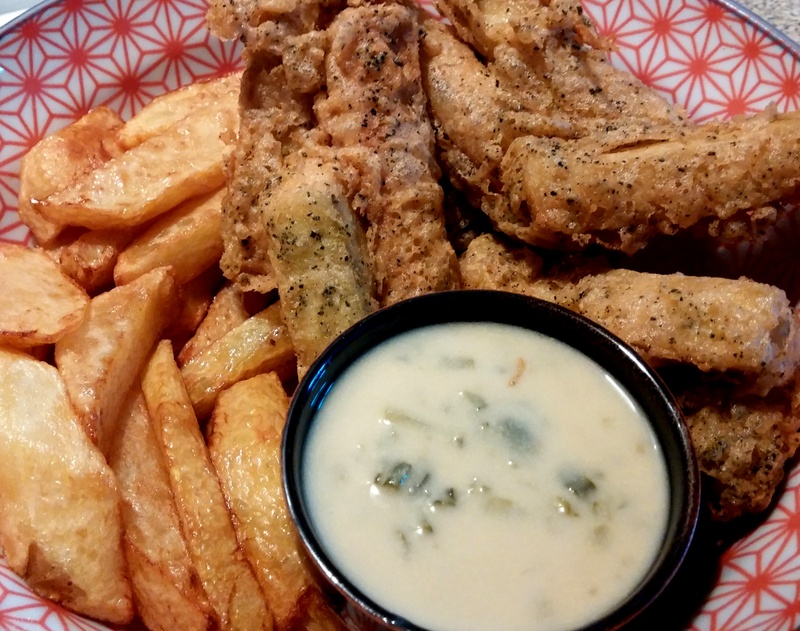 – Batter and fry the fish right after you finish with the fries. Serve together. Drink beer and enjoy. Posted in Snacks and Fast-foodTagged Classics, Fast Food, Fries, Tofu, Vegan, Vegan FishBookmark the permalink. Food is no longer served in newspaper in Britain actually.